MAHWAH, NJ – EDAX, Inc., a leader in X-ray microanalysis and electron diffraction instrumentation, has introduced the latest revision of its APEX™ Analysis Software, which now is available not only for the Element, but also for the Octane Elect Energy Dispersive Spectroscopy (EDS) Systems. APEX™ was developed to ensure high-quality results that, combined with its ease of use, accelerates and simplifies compositional analysis, delivering high-quality data processing along with accurate and reliable results. The APEX™ interface is very user friendly and can be customized for a specific workflow, offering a wide choice of layouts, colors and data report formats. •	Advanced Reporting, including the ability to generate reports directly from APEX™ Live mode and a report designer, which provides flexible and customizable templates for the presentation of images, spectra, quantification results, text, logos, and sample information. •	Drift Correction with parameters set automatically for easy operation along with options to save drift images and define manual reference areas for advanced correction needs. •	Dynamic Element Mapping, including the addition and removal of elements in Mapping and Linescan modes to show only elements of interest. •	CompoMaps live net mapping capability for the separation of elemental contributions from overlapping peaks to individual elemental maps for more accurate representations of EDS maps. 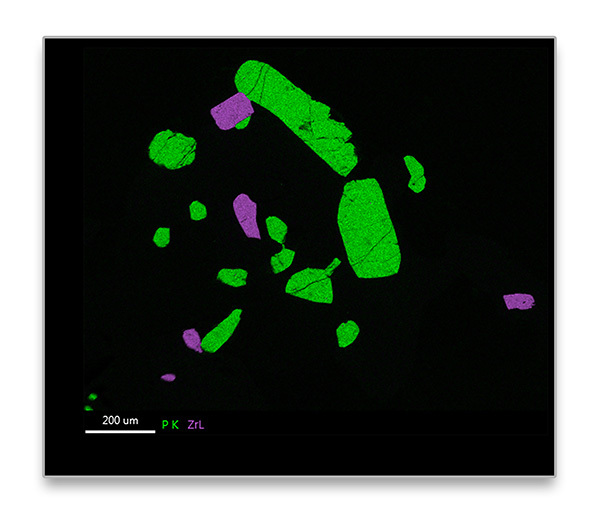 •	Spectrum Match now is available for APEX™ together with a newly launched Smart Materials and Minerals Library option, which enables the matching of a collected ‘unknown’ spectrum to a library of reference spectra. EDAX is the acknowledged leader in Energy Dispersive Microanalysis, Electron Backscatter Diffraction and X-ray Fluorescence instrumentation. EDAX designs, manufactures, installs and services high-quality products and systems for leading companies in the semiconductor, metals, geological, pharmaceutical, biomaterials, and ceramics markets. Since 1962, EDAX has used its knowledge and experience to develop ultra-sensitive silicon radiation sensors, digital electronics and specialized application software that facilitate solutions to research, development and industrial requirements.